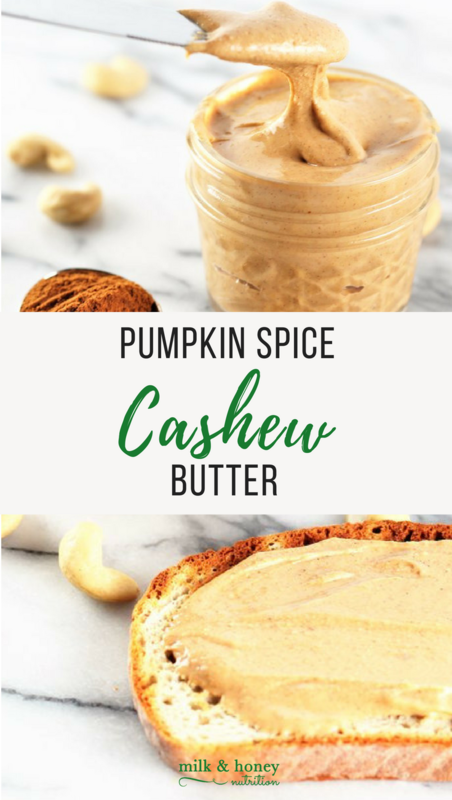 Perfect for the Fall season, here’s a four-ingredient recipe to make your own Pumpkin Spice Roasted Cashew Butter. Arrange the cashews in a baking dish in an even layer. Spray them with the avocado oil spray. Shake the pan to toss the nuts around some, then spray them with the avocado oil again. Bake the cashews on 400 for 5 minutes. Pull the pans out of the oven and shake to redistribute the cashews. Return them to the oven and bake for an additional 3 minutes. Remove the cashews from the oven and let them cool for 5-10 minutes. Add the roasted cashews to an 11-cup (or larger) food processor. Process for 10 minutes. After about 1 minute, add in the salt and pumpkin pie spice. You may need to stop the food processor and scrape down the sides 1-2 times during the 10 minutes of processing. You'll know it's done when the butter is very liquid-y, and your kitchen smells like heaven! This recipe will make about 8oz. of cashew butter. Some other great snack ideas..